Many people assume that window tint must be dark in order to filter out the sun’s harmful rays. The good news is, you don’t have to change your window’s look or style to get the protection you need. Like an invisible sunscreen, you can get the benefits of protection, without compromising appearance! Contrary to popular belief, window film didn’t start out as a dark tint. The history of clear window film began with rockets and outer space, where NASA was looking for quality sun protection for its astronauts. These space explorers were navigating a black universe among the sun’s harmful rays, and so they required clear windows that could provide sun protection. Thanks to the space program, window film technology became more advanced, and people found more uses for this type of film, for example historical building restoration. People liked the idea of added window protection without compromising appearance, allowing them to protect the building interiors so that they can avoid restoration costs in future. Numerous historical buildings and art museums have been given window film, for example, the Wilshire building in Beverly Hills was renovated with new window film instead of replacing windows. As a result, the original style of the building remained the same! A lot of commercial building owners have also turned toward invisible protection. For example, shop owners want their customers to be able to see inside, yet still want the security of window film. This clear window film has now become favored among residents too, and is often known as residential window film. New Window Film Technology: How Does It Work? In the past, older window film technology used dark tint to block out visible light and UVB rays, but did not have the ability to block out both UVA and UVB rays. However, with new window film nanotechnology, window film no longer has to be dark. Due to the new UVA protection properties, the need for dark tint was eliminated, and so ceramic window film was made. Unlike many other types of window film, ceramic window film does not contain any metalized layers. The technology works by embedding ceramic nanoparticles into the film, which are invisible to the naked eye. These particles contain the strength of ceramic without the opacity, giving you the benefit of clear windows with all-round strength and sun protection. Ceramic window film eliminates the danger of reduced visibility when driving. You also won’t have to worry about frown lines or wrinkles that are so often caused by avoiding the sun’s glare! Feel more comfortable in your own home or vehicle and reduce the risk of dehydration and heatstroke. Turn off the AC and spend less money on cooling systems. You’ll be saving costs as well as helping the environment by reducing your use of resources! Ceramic window film prevents glass from breaking into shards, as these shards are held into place by the film, giving you added protection. The ceramic particles add extra strength to prevent it from breaking, keeping you safe from potential hurricane debris or attempted robbery in both home and vehicle. No tint means no change, giving you the option to give all your windows protection without changing the look! Having dark tints can have its own problems. For example, your car might look more suspicious, as dark tints are used for privacy. To the police (or potential thieves), this could mean that you might be hiding something. What’s more, dark tints might impede vision on cloudy or rainy days, making it unsafe to drive on the road. If you have dark tint, you must check to see that the tint complies with Florida’s window tint laws. 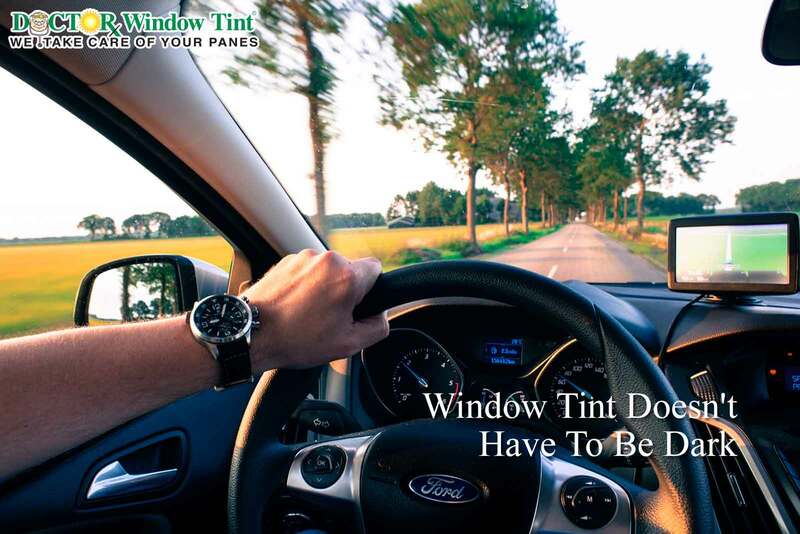 At Doctor Window Tint, we provide ceramic window film that is unique in its service – we make house calls, so that we can come to you! Open the blinds, take down the sun visors and enjoy the sunlight – without compromise!